Western Australia's massive scope means it is filled with a number of beautiful destinations - particularly for those who are fans of coastal experiences. The gorgeous and charming town of Exmouth is one such destination, with multiple experiences on its doorstep that help separate it from some of its peers. Nestled on the WA coastline and neighbouring the ‘other’ great reef in Australia, Ningaloo Reef Marine Park, Exmouth offers a range of aquatic, adventurous and scenic experiences for visitors. 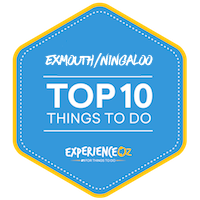 We take a look at 10 of the top things to do in Exmouth, WA in detail below. The Ningaloo Marine Park possesses many natural wonders, but few attract visitors from thousands of miles away like the chance to swim alongside the world's largest fish. Whale Sharks are the marine park's signature highlight, as the massive and graceful creatures gather regularly just off the coast of Ningaloo, and as a result offer one of the most easily-accessible of such experiences in the world. As a result, the largest fish in the world is a frequent sight in the waters off Exmouth, making swimming with Whale Sharks one of the best and most popular things to do in the region and a true Western Australian "bucket list" adventure as a whole. These huge plankton eaters arrive in the region after the annual coral spawning period; they can grow up to 18 metres in length, and swimming alongside them makes for an encounter that defies description. It begins with a large shadow looming in the distance that gradually approaches and may lead to an initial, instinctive surge of adrenaline. The massive and graceful creatures gather regularly just off the coast of Ningaloo, and as a result offer one of the most easily-accessible of such experiences in the world. However, it's a quick adjustment to the realisation that the sharks will do you no harm - their large, spotted and somewhat intimidating forms bely the shark's peaceful nature, and their movement is both mesmerising and surprisingly fast. With an experienced guide and photographer both in the water with you and a spotter plane gliding overhead to find the whale sharks, you’ll be in safe hands as you jump in for the adventure of a lifetime. Tours out on the water to swim with whale sharks depart from Exmouth with operator Ocean Eco Adventures who offer boutique cruise experiences that specialise in emphasising marine interaction. They offer an excellent mix of both luxury and personalisation that aims to cater to guests of all ability levels. This experience is one you’re not likely to forget and will be sure to leave a lasting impression - for the rest of your days. Turquoise Bay is one of the best places to dive in and explore the WA coastline from under the water. Just a few metres from Ningaloo Reef, you’ll be able to enjoy the fringing reef of the area and take in the beautiful and vibrant colours from underwater. Simply swim straight out into the water and let the current calmly carry you north across the reef. The Drift Snorkel is a popular natural attraction for visitors looking to relax and snorkel. The drift starts around 300 metres up the beach from the carpark. Simply swim straight out into the water and let the current calmly carry you north across the reef. The best part about this attraction is that it is completely free! Snorkellers should take note that the exit point is the large sand bar marking the start of Turquoise Bay. Swimmers are urged to take caution as the currents are quite strong. Also, visit the Exmouth Visitor Centre before your snorkel to check tide times. If you want to learn about the reef and the animals that live here while you explore it then you can embark on a snorkelling tour of Ningaloo Reef with Ocean Eco Adventures. One of the best whale watching spots in the country, the whales pass by Exmouth and its surrounding regions on their trip up north to escape the cool waters and again when they journey back south. This is not just any cruise, Ocean Eco Adventures’ Sunset Whale Watching Cruise combines the impressive sights of the migrating whales and mixes it with a relaxing cruise of this breathtaking region at sunset. The Ningaloo Coast see the highest density of humpback whales in all of the Southern Hemisphere during their migration period from June to November. It is likely that during this time of year you will also witness the humpbacks with their newborns which makes for a truly magical experience. For 2 hours, you’ll be treated to fresh Exmouth prawns, tea and coffee, and gourmet platters as you depart the coastline into Ningaloo Marine Park. The cruise operates during whale migration season from September to early November with cruises departing at 4:30pm and returning around 6:30pm. If you’d rather stay relatively dry while exploring still exploring the beautiful waters of Ningaloo Reef, then a kayaking tour is perhaps the ideal way to go. Paddling atop the vibrant marine park, you’ll be treated to top-down views of the colourful coral and its various local marine inhabitants. Under the leadership of a knowledgeable guide, you’ll learn about the reef and the animals that live in it while experiencing it first hand. Ningaloo Reef is beautiful and accessible, and kayaking offers a chance to absorb its beauty for those wanting to stay dry or who may be not too confident in the water. Kayaking offers a chance to absorb its beauty for those wanting to stay dry or who may be not too confident in the water. Operator Capricorn Sea Kayaking offer a range of small group, ecologically-minded tours based out of Exmouth that vary in duration from half day to full day options. For those looking for an extended experience, they also provide multi-day sea kayak tours that incorporate a mix of camping into the proceedings as well. Taking a tour comes highly recommended if you’re eager to learn about the reef, its inhabitants and the surrounding region. If you’re looking to just explore the reef at your own pace, then the option also exists to hire kayaks and various other water equipment for personal use. The road journeys up to Vlamingh Head Lighthouse and offers panoramic views of Ningaloo Reef and the Indian Ocean. Just 17 kilometres from Exmouth or a massive 14 hour drive from Perth, the Vlamingh Head Lighthouse Scenic Drive is one of the most scenic drives in Australia. If your visit coincides with whale migration season you’ll be in for a treat as you can see the whales moving along the coast from land. Explore the rich history of the lighthouse that dates back to the early 20th Century. This is a great place to stop and soak in the stunning ocean views and sights of WWII ruins. The drive itself starts from just outside of Exmouth and is sometimes subject to closures, so be sure to check with the Tourist Centre before you embark on the journey. Don’t forget your camera on this drive as the views are incredible! Built in 1912, the Vlamingh Head Lighthouse stands strong on the coastline, 17 kilometres north of Exmouth. Overlooking the vibrant Lighthouse Bay, the lighthouse is one of the only Australian destinations where you can watch the sun rise and set in the one spot. If you can manage an early start to watch the sunrise and make it back for sunset, you’ll be treated to an unforgettable experience. The lighthouse currently doesn’t offer any tours, however, the history of it is quite interesting. Vlamingh Head Lighthouse was used as a refuelling station for US Navy ships during World War II and has weathered many storms. If you’re visiting during the day, you won’t be disappointed. The hill the lighthouse sits on provides some incredible views of the surrounding area making for some incredible photo opportunities. The canyon was named after the shotholes left during the search for oil in the 1950s from the explosive charges and is another part of Cape Range National Park. The road turnoff is 14 km south of Exmouth on an unsealed road which will lead you to the bottom of the canyon. Located in close proximity to Charles Knife Canyon, the Shothole Canyon is another breathtaking destination with some world-class views. Visitors will be delighted by the sight of the colourful canyon rock walls which looks spectacular on camera. Offering spectacular views of the Cape Range National Park, the Shothole Canyon can be driven around with ease. Along the drive, you’ll be able to see the beautiful colours of the canyon rock face and the surrounding region. There are various lookouts located in the canyon, each offering views of Cape Range and its 700 caves. Jump you car and get ready for a scenic adventure in Charles Knife Canyon. The road takes you on an adventure winding from Exmouth to the top of the range for some spectacular views of the surrounding region. Featuring a picnic area, the Thomas Carter Lookout at the top of the range is the perfect place to sit and relax while taking in gorgeous views of the Charles Knife Canyon. If you’re chasing an unforgettable experience, head up to the lookout at sunrise to watch the light roll over the Exmouth Gulf. For those eager to get out of the car and explore on foot, there is a bush trail that treks its way through the canyon floor and through the national park. A popular spot for outdoor enthusiasts, Yardie Creek Gorge offers some great bush walking, boating and wildlife spotting opportunities. The walking trail is a half hour return trip, stretching only 500 metres along Yardie Creek’s cliffs. Along the trail, you’ll be treated to impressive views of the gorge itself with sights of Ningaloo Reef in the not too far distance. With a picnic area and toilets, you’ll be able to make a day of it. If you’re looking to get out on the water local operator Yardie Creek Boat Tours run enjoyable daily cruises out on the gorge to see the beautiful sights of the area from a different perspective. Cruises cost between $15 and $35 with options for children, concessions, adults and families. Yardie Creek Gorge is a permanent water hole surrounded by large, red limestone cliffs and is frequented by black footed, wallabies, Euros, red kangaroos and a variety of different bird species. The gorge is a permanent water hole surrounded by large, red limestone cliffs and is frequented by black-footed wallabies, Euros, red kangaroos and a variety of different bird species. Located around half an hour from Exmouth, the gorge is also a popular camping spot. Unfortunately, this isn’t a free campground, with sites costing up to $10 per adult per night. The only facilities available are toilets and no fires or pets are allowed. The skeleton of the SS Mildura can be viewed from the beach at Lighthouse Bay. Although there isn’t much to see, the history of the wreck is something to admire. Not just another beach, the Mildura Wreck makes walking along the coastline far more interesting as you witness a piece of history in this area- just 20 km from Exmouth. The hull of the ship was used for bombing practice back during World War II, with the usable parts of the ship salvaged for use. The wrecks can be reached with just a short drive from Exmouth and are visible with the naked eye from the beach, so no massive camera zoom needed.